More than 100 people gathered in front of Spokane City Hall on Thursday evening to rally for police accountability and changes to an oversight process they see as flawed. 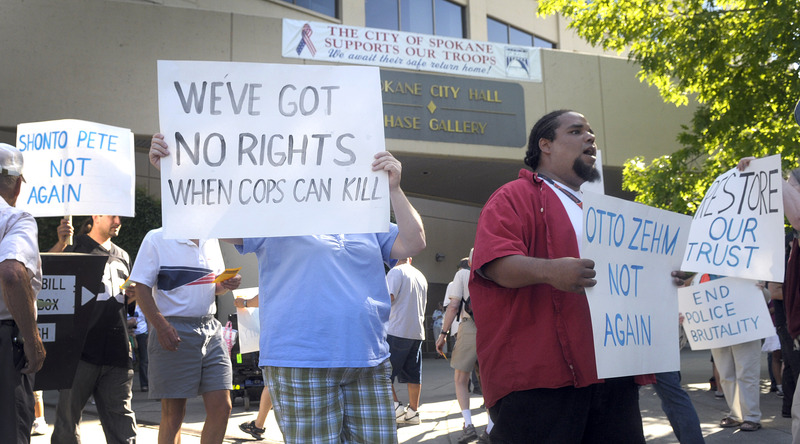 The rally followed the federal indictment of Spokane police Officer Karl Thompson for his role in the death of mentally ill janitor Otto Zehm and comes days before the Spokane City Council is set to vote on hiring a police ombudsman. “We wanted to offer people the opportunity to speak out … to create change in order to have a relationship of trust with city leaders and Police Department,” said Liz Moore, director of the Peace and Justice Action League of Spokane, who along with Shonto Pete and his family organized the rally. About 10 other community-based groups joined in. Levy jumped to his death off the Monroe Street Bridge in 2007 after a 20-hour standoff with police. An officer tried to subdue the 28-year-old schizophrenic with a Taser, but only one prong hit and Levy jumped. A jury found former Officer Jay Olsen innocent in the shooting, and Pete was exonerated of the auto-theft charge related to the case. Olsen quit his job before facing an internal police review for alleged misconduct. “Something needs to change,” Pete said. PJALS, Pete and others are urging city leaders to change the ombudsman’s duties so to give him investigative subpoena authority, enabling him to instigate and carry out his own investigations. Pete said he talked with Mayor Mary Verner last week, and urged her to also reconsider her choice for police ombudsman. Tim Burns, 55, who served as a police officer for 22 years in Los Gatos, Calif., is now a neighborhood preservation manager in Visalia, Calif. The Spokane City Council is expected to consider Verner’s choice Monday. “If she wanted (accountability), she shouldn’t have hired another cop,” Pete said. About a half-hour after the rally began, city spokeswoman Marlene Feist sent out a news release and fact sheet of frequently asked questions about the ombudsman post. It says the ombudsman will not have investigative or disciplinary authority over officers.